What did American and European women use in the past for menstruation? This beautiful ad consists of two pieces: a cardboard background and another piece of cut-out cardboard - the ladies, box and information at the bottom - that casts a real shadow on the landscape. It's 700 x 950 x 6 millimeters (roughly 2'4" x 3'1" x 1/4"). German drugstore windows today are still often riveting. Hiking - wandern in German - has always been popular in Germany, at least in the last 100 years. I spent most Saturdays from 1974 to 1984 hiking in the hills around Heidelberg, walking paths marked with stones sometimes chiseled with dates from the 1700s. We could hear cuckoos in the silence - they sounded just like the clocks! Just a half hour from the oldest university in today's Germany we could cross a river the Romans sailed and amble through the unattended, wrecked rooms of a medieval monastery that perched on top of a hill a short walk from an amphitheater that enclosed band concerts by the Nazis. Most of Germany's 15,000 or so castles are deserted and half rubble. You can even buy many of them if you fix them up. But, wonder of wonders, I've wandered from menstruation! I gleaned the picture and information from the catalog "Menstruation: Monatshygiene im Wandel von 1900 bis heute," Text und Katalog: Sabine Zinn-Thomas und Walter Stolle. Eine Ausstellung des Hessischen Landesmuseums Darmstadt in der Außenstelle Lorsch, 26.11.1998 bis 31.7.1999. My translation: "Menstruation: Changing menstrual hygiene [in Germany, mostly] from 1900 to today ." Text and catalog: Sabine Zinn-Thomas and Walter Stolle. An exhibition of the Hessian State Museum, Darmstadt, in the branch at Lorsch, from November 26, 1998 to July 31, 1999. I translate the text as: "A [really 'The,' but that doesn't sound right in English] woman doesn't need to hold back! A woman who wants to keep healthy and youthful needs movement! She takes care also that she's not hindered for c. 60 days a year because she knows the advantages of Camelia. Camelia, the ideal reform menstrual pad." "Reform" in Germany means something that's improved through careful thought; the word decorates many stores and product descriptions in Germany, even today. 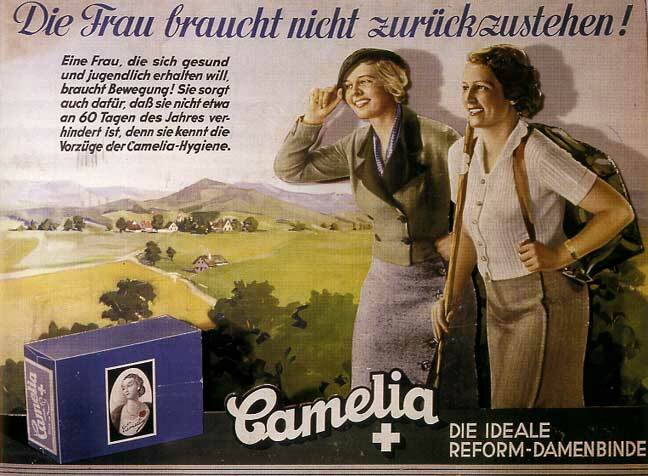 Camelia is a Reform product because it's disposable, not like the old-fashioned German washable pad. Many drugstores in Germany still show ads in large windows; the stores in my area of the U.S.A. seem to have abandoned window advertising. Maybe it's because people seldom walk anymore - they drive. See a close-up of the box and woman in the picture on the box - and read her story.